The L501 Colour Inkjet Labels printer allows you to printer your own high quality high resolution labels in-house and on-demand A4 size labels 8.5" (215.9mm) wide in different material including: Media Material Types paper, polyester, polypropylene, and vinyl label stocks. 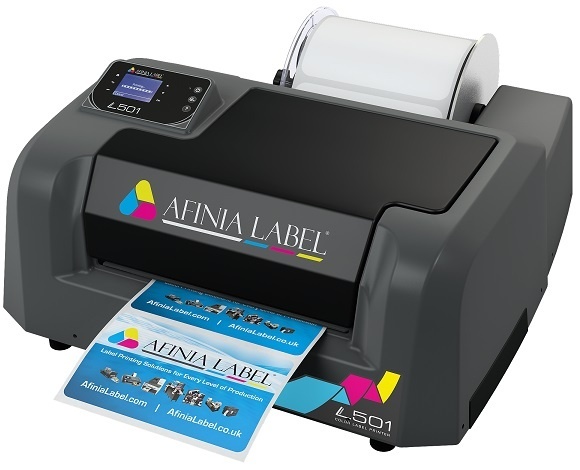 The Afinia Label L501 is the first inljet colour label printer with Duo Ink Technology, designed to print with both pigment and dye inks. This dual-ink feature allows for a quick transition from dye-based vibrant and colorful prime labels, to ultra-durable pigment-based label applications with a simple printhead swap. The Afinia L501’s dye-based prints are high-impact, colorful, and vibrant, making them ideal for prime labeling applications, such as in retail environments. The Afinia L501’s Optional Label Rewinder makes managing your labels easy, and allows you to conveniently rewind your labels right onto a 3″ core. It’s a great, recommended addition for companies that experience high usage or heavy duty jobs. Media Types:Compatible with wide range of paper, polyester, polypropylene, and vinyl label stocks. Black Mark Size: 0.125" – 0.3 "
Warranty: 1-Year back to base.